Because most writers use a home office for their work, making sure that space is neat and functional is a must in order to ensure optimal proficiency, increase productivity, reduce stress and tension, and create a peaceful work environment. One way to accomplish all this is to follow the philosophy of feng shui. Feng shui, simply put, is the Chinese system of harmonizing with the surrounding environment. It is based on the four directional corners of feng shui, which are of importance when properly setting up a room or workspace; these are north, south, east, and west. The ordinal, or intermediate, corners are northeast, southeast, northwest, and southwest. There are also secondary-intercardinal directions, such as north-northeast, east-southeast, south-southwest, and so on, but for the most part, the cardinal and ordinal corners are used in feng shui. Place Your Desk in "Command Position"
Simply put, the “command position” is just the position when sitting at your desk that puts you most in command (of your area and your work). This position stems from an ingrained need to have visible control over a person’s surroundings. 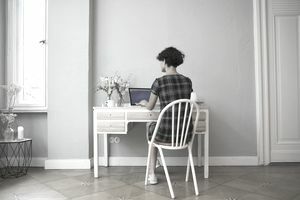 For writers, the ideal “command position” is to have a view of the door from the chair, a solid wall behind you, and a nice view out of a window. If your current room does not have this set-up, you might have to move your desk to another room. If that's not possible, you could also simply place a mirror in your room where you’re able to see the door from your desk. Even if you use your lap or a counter and not a desk, the importance of facing an entrance from where you’re working is still crucial. Use this position in order to feel the most in control and confident in your area, whether you’re working with hundreds of other employees or writing in your home office. Known as the writing and creation corner in feng shui, the southeast point of both your desk and your room should be set with items that are in balance with the southeast energies. These items include aquariums, plants, and tabletop water fountains. As this is also the wealth corner, a water fountain would work to potentially increasing earnings from your writing as well as increase creativity (per feng shui principles). Try placing a nice fern and a small tabletop fountain in that corner to maximize the energy or a pretty potted flower next to a small fish tank for similar results. Since the south area is the “fame” area of feng shui, focus all of your personal and work/career accolades and accomplishments here, such as your high school and/or college diplomas, special plaques and awards from your career, praise and compliments from clients or co-workers, even sports trophies and plaques from your high school or college days. Colors have various significances in feng shui, such as luck, money, romance, wealth, success and energy. For example, yang colors of feng shui include red, maroon, mauve, lavender, gold, brown, and tan/beige. These are significant to areas of romance, luck, and wealth. Try using a combination of gold and lavender, or gold and red, to enhance energy, success, and money. If you don’t want to repaint your entire home office, you can still add in these colors by using pictures, wall hangings, art pieces, pillows and throws, and flowers. Other color combinations to use in a writer’s office are yellow and red (for unity/prosperity and red for energy and excitement), orange and purple (orange symbolizes optimism and purple represent affluence), or gray and brown for clear-headedness and stability. If you've got the freedom to design your writing space for maximum success and pleasure, why not add a little synergistic interest according to these ancient principles? At the very least, they can serve as a guide or inspiration in your planning, and at the most, they may increase your success and freelance writing income. Good luck!